Misti Spillman cleans the ledger monument of Major David Ziegler, a Revolutionary War soldier and the first mayor of Cincinnati. 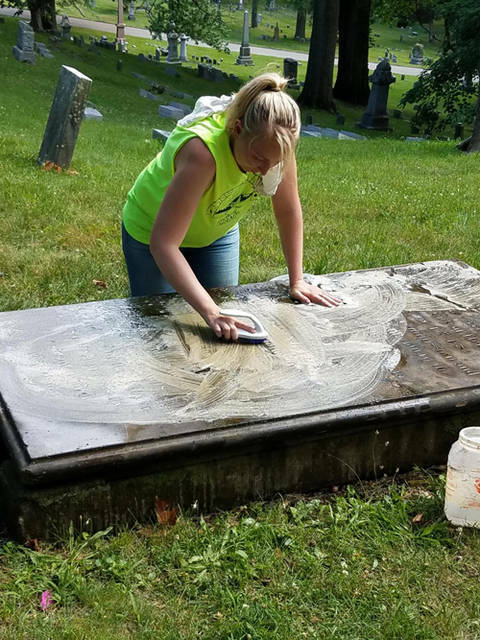 DAYTON – Woodland Cemetery and Arboretum is partnering with gravestone restoration expert Misti Spillman as she conducts a series of workshops for beginners who are interested in headstone cleaning and restoration. Workshops will be conducted at Woodland Cemetery and Arboretum, located at 118 Woodland Ave. in Dayton, from 10 a.m. to 3 p.m. on Saturdays May 11, June 8, Aug. 24 and Sept. 21. The cost is $30 per person and includes hands-on, one-on-one and group instruction on headstone preservation techniques including fixing breaks, resetting, cleaning and how to mix proper mortars for stone repair. Attendees also will receive a headstone cleaning starter kit that will include all of the tools needed for the day. The entire workshop will be spent in the cemetery. A break for lunch will be provided. Attendees can bring a lunch or visit any of the restaurants on Brown Street. Spillman has a background in researching and restoring cemeteries. She worked as an AmeriCorps member at the Ohio History Connection and serves as a reference and liaison to numerous museums and historical societies throughout Ohio. She is the owner of Reviving Cemeteries, LLC. Participation is limited to 25 people per class. Proceeds benefit the Woodland Arboretum Foundation. To register for the May and June class, go to http://bit.ly/HeadstoneRestoration or visit the Woodland Cemetery website event page at woodlandcemetery.org/tours-and-events.